The sneaker community has some of the most loyal and passionate fans in the world. People dedicate their lives to ammassing an amazing collection of kicks. As a sneakerhead I can tell you that there is no better feeling than pulling up to an event with a crispy pair of exclusive kicks. One of the most beautiful things about sneakers is they often come out at a fairly reasonable price point when they arrive at box price. As a result, you see people from all walks of life in some of the most amazing sneakers everyday. Over the past 15 years, you have seen love of sneakers dominate television shows, commercials and sports. From Seinfeld, to The Fresh Prince, to Lil’ Penny, it was message was clear: It’s all about what’s on your feet. TheDribbleDrop: Let’s talk sneakers, let’s start on the on the court. Which ones do you prefer: Nike, Under Armour or Adidas and why? Nike is number one for me due to the fact that they are very comfortable. You have everything from Kobe to Vapormax's. I’m really into the Nike Air Max 97’s now as well. I don’t have that many Adidas sneakers as I’m a Nike guy for the most part. With that being said I do like Yeezy’s. TheDribbleDrop: Off the court, who’s making the best Non-Jordan basketball shoe that you would wear casually? Kahlil Whitney: Definitely Vapormax's. I like the colorways they have been going with. TheDribbleDrop: What were three of the best sneakers you wore this year in regards to style and comfort? 1-Nike Air Jordan Retro 11’s, Cherry Red. 2-Kyrie 4’s. Grey and Green colorway like my school Roselle Catholic. TheDribbleDrop: When buying a shoe on or off the court, what are you looking for exactly? Style? Comfort? Kahlil Whitney: Style and comfort are very important to me. The leading factor to me buying any shoe is revolved around that. TheDribbleDrop: It seems like kids are wearing more lightweight, low top sneakers that can sometimes leave the ankle a bit vulnerable. We want protection, but it often comes at the price of the shoe being a bit bulky. What are your thoughts on this explosion on low tops and comfort vs. protection? Kahlil Whitney: The thing is, I actually sprained my ankle the worst with high tops. After that, I stopped wearing high tops. I feel like I have more control in low tops. I feel more free. I feel like high tops are for guys who really have legit ankle problems in my opinion. I get a good tape job before I play in my low tops and I’m good to go. TheDribbleDrop: This weekend what were you wearing at Nike EYBL? Any significance to the shoes? Kahlil Whitney: Right now I’m wearing a pair of all-white Kobe’s. I also wore a pair of the Paul George 2 sneakers in the Oklahoma City Colorway. I also wore a pair of Bred 11’s. TheDribbleDrop: What are your Top Sneakers of all time? 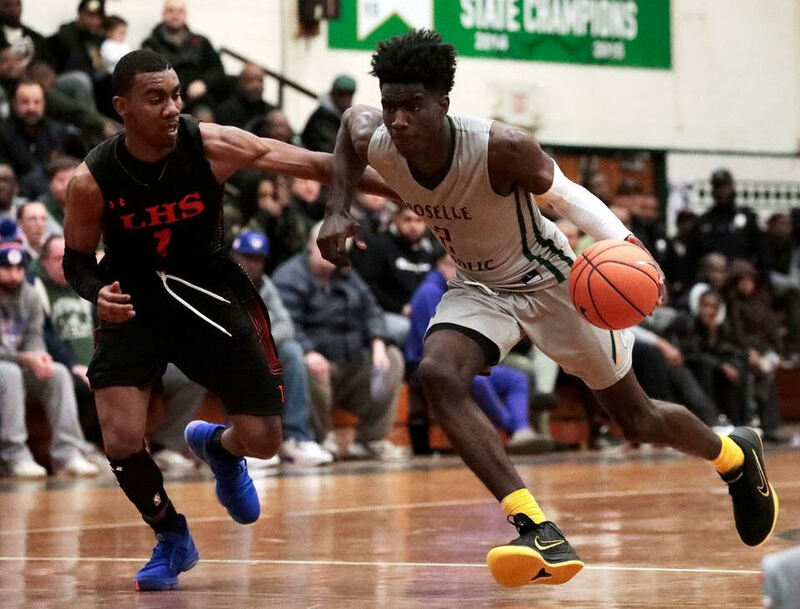 Kahlil Whitney: In no particular order, here are five sneakers I would take with me anywhere. TheDribbleDrop: In 5-10 years, which players sneaker will be worn more on and off the floor by your generation: Lebron, Kyrie or Kevin Durant? Kahlil Whitney: Kyrie I think. You didn’t mention Kobe, but I think with our generation his shoes have a lot of respect and our attention. TheDribbleDrop: If you were a Jordan Executive and you had the chance to sign one member of this rookie class to Jordan because you think he will be the most productive player and have the biggest fan base, who would you choose and why? Kahlil Whitney: Donovan Mitchell. I think that is a no brainer.